EyakTek is fulfilling our promise to provide socio-economic benefits for our community of native shareholders. We regularly hold charity events that benefit the Eyak Foundation, which provides scholarships to Alaska Native youths. And we are involved in many other programs to benefit the Alaskan and Washington, D.C. communities. EyakTek employee Lloyd Matthews teamed up alongside area businessmen to provide fly fishing training for healing and rehabilitating soldiers at Fort Sam Houston. The Warriors in Transition unit at Brooke Army Medical Center organizes morale-building events for healing and rehabilitating soldiers that have been wounded through combat in the Global War on Terrorism (GWOT). EyakTek is happy to have contributed to The Society of American Military Engineers (SAME) donation drive supporting our deployed troops in Afghanistan and Iraq and their families. EyakTek employees provided items that not only go to our service men and women, but also school supplies and toys for Afghan and Iraqi children. SAME, the premier professional engineering association in the United States, unites architects, engineers and builders in the public and private sector to improve capabilities and to prepare for – and overcome – natural and manmade disasters, acts of terrorism and improve security at home and abroad. 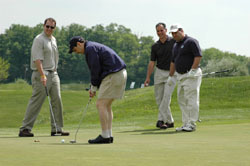 In June 2004, EyakTek held the First Annual EyakTek Classic, a government-industry-wide networking event and golf tournament. And in May 2005 we held the Second Annual EyakTek Classic. All proceeds from both events were donated to the Eyak Foundation, an organization committed to preserving the culture of Alaska Natives. Together, the events have raised over $15,000, which is being used to provide scholarships to qualified Alaska Native youth. 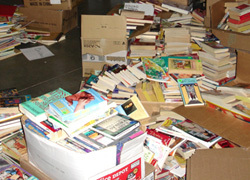 EyakTek held a book drive in December 2003 and 2004, which successfully collected over 14,000 books. The books were delivered to rural communities throughout Alaska, to help stock classrooms and libraries that previously had few such resources. Many of the books were sent to the public library in Cordova, from where the Eyak people originate. The donation has augmented the library’s collection and replaced badly worn books. The books were donated by public libraries, businesses, and private individuals throughout the Washington, D.C. metropolitan area. Volunteers processed and sorted the books, which were then shipped to Anchorage, Alaska. The Iditarod is an annual race, where mushers use teams of dogs to race from Anchorage to Nome, Alaska. The race lasts 10-17 days and covers over 1,000 miles. In 2005, EyakTek sponsored a rookie musher named Tom Knolmayer, who is a surgeon with the U.S. Air Force in Alaska. 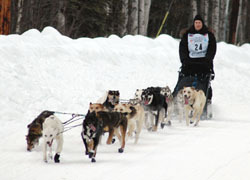 We were proud to provide funds that helped him finish his first Iditarod.